The Ohio Green Party sponsored a town hall Saturday evening at the Delaware Community Center YMCA/Ohio Army National Guard Readiness Center in Delaware. Candidates Joe Manchik (left), Ohio 12th Congressional District, and Gary Cox, Ohio Senate District 19, work on posting Manchik’s campaign sign on the wall just before the forum started. Delaware County residents received the opportunity to quiz Green Party gubernatorial candidate Constance Gadell-Newton, Ohio 12th Congressional District candidate Joe Manchik, and Ohio’s 19th Senatorial candidate Gary Cox on their viewpoints of current issues. All three candidates are up for election on Nov. 6. The Green Party sponsored the town hall meeting Saturday evening at the Delaware Community Center YMCA/Ohio Army National Guard Readiness Center, 1121 S. Houk Road in Delaware. Vietnam veteran and Ostrander Mayor Larry Crile, R, said it was an honor to moderate the event, though it had a limited turnout. He has been mayor of the small Delaware County community for 12 years. According to ohiogreen.org, the Ohio Green Party’s key values are grassroots Democracy, social justice, equal opportunity, ecological wisdom, nonviolence, decentralization of wealth and power, community-based economics and economic justice, feminism and gender equity, respect for diversity, personal and global responsibility, and future focus and sustainability. The first topic of the evening was the weakening of home rule by federal and state governments through funding cuts to local communities. Gadell-Newton said she is a community activist and practicing criminal defense attorney and guardian ad litem in Franklin County, representing the best interest of children, defending the rights of low-income families, the rights of citizens against government oppression, human trafficking victims, and those struggling against drug addiction. She is co-chair of the Ohio Green Party. Gadell-Newton said local people should be the ones who decide and not the federal or state governments. Cox is an attorney who has worked for the Ohio Attorney General’s Office prosecuting corporate polluters. He helped form the Farm-to-Consumer Legal Defense Fund and was once an organic vegetable farmer who supports a sustainable agriculture of Ohio farmers feeding Ohioans, instead of exporting overseas. Cox said the more local the government, the more accountable it is. Manchik said he is running for Congress to take America back from the corrupt corporations. He owns and operates Manchik Engineering & Company, and he attended the Ohio Institute of Technology, which is now DeVry University. Manchik said the local community should be the ones deciding on the local issues. Manchik said he is in total disagreement with the U.S. Supreme Court’s ruling in Citizen United v. Federal Elections Commission, a landmark Constitutional law ruling in the regulation of campaign spending by large organizations. Manchik said there needs to be an Amendment added to the U.S. Constitution to reverse the ruling by the highest court in the land. “We have the best government that money can buy,” Cox added to Manchik’s comment. All three candidates stated that it is the policy of the Green Party that candidates do not accept corporate donations. Other issues that the three agreed upon and support are Issue 1, universal health care with treatment options for people with mental health and substance abuse issues instead prison time, uniform funding for schools and extending the idea of a free education to include pre-K and college, and renewable clean energy. Manchik said he is not in favor of nuclear power, and he pointed at Chernobyl and Fukushima as examples. For more information on the candidates, visit https://www.constanceforohio.org/ for Gadell-Newton, http://www.ccv.org/wp-content/uploads/Voter-Guide-Response-Gary-Cox.pdf or https://ballotpedia.org/Gary_Cox_(Ohio) for Cox, and https://ballotpedia.org/Joe_Manchik or https://www.facebook.com/JoeManchikForCongress/ for Manchik. https://www.delgazette.com/wp-content/uploads/sites/40/2018/10/web1_Green-Party-Town-Hall-copy.jpgThe Ohio Green Party sponsored a town hall Saturday evening at the Delaware Community Center YMCA/Ohio Army National Guard Readiness Center in Delaware. 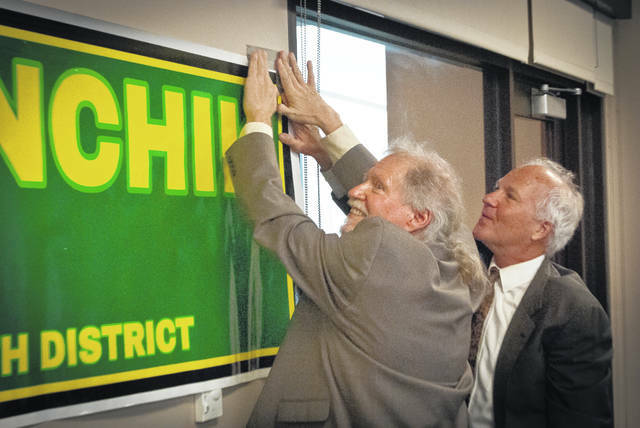 Candidates Joe Manchik (left), Ohio 12th Congressional District, and Gary Cox, Ohio Senate District 19, work on posting Manchik’s campaign sign on the wall just before the forum started. This entry was tagged ConstanceGadell-Newton, D. Anthony Botkin, Gary Cox, Green Party, gubernatorial candidate, Joe Manchik, Ohio 12th Congressional District candidate, Ohio’s 19th Senatorial candidate. Bookmark the permalink.